Barnett Newman was one of the New York artists invited to contribute original compositions in homage to poet Frank O'Hara (1926-1966) for the "In Memory of My Feelings" project in 1967. 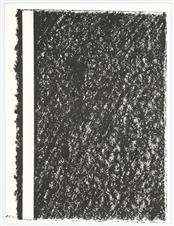 The lithograph itself is 12 x 9 inches and the entire sheet is 12 x 18 inches (there is a fold in the middle and the poem is on the left side). Since the full sheet is a bit large for our scanner, the second photo shows most but not quite all of the composition.